Contest is now over but check back soon for our next one! So we want to know how YOU would improve the team before the Trade Deadline! Enter in the comments on Facebook, Instagram or Twitter for a chance to WIN one of two pairs of tickets to an Ottawa Senators season ending game in Sentaors Club Bell. Dinner included! Most creative answer & closest to what actually happens will WIN! *Winner will be chosen by Kent Browne, Brokerage Owner, at his sole discretion. 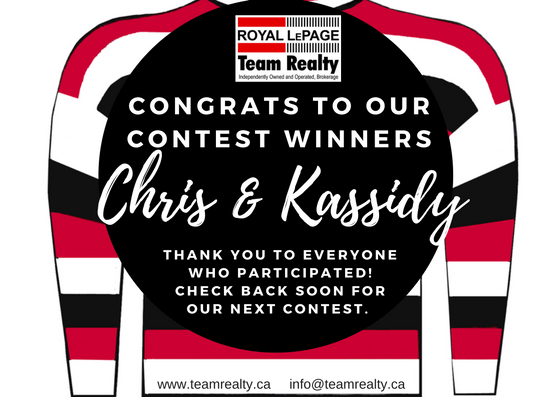 Winners will be contacted via the social media platform on which they entered and must be available to pick up tickets at one of our Royal LePage Team Realty branches, transportation to and from the game not included. This prize holds no cash value. This contest is in no way connected to or sponsored by Facebook, Instagram, Twitter, the NHL, Ottawa Senators, Canadian Tire Centre, Club Bell, TSN or Team 1200.